Well, interesting news courtesy of the Herald Sun (and courtesy of the clever duck on Twitter who took a photo of the relevant article so we don't have to deal with News Corp paywalls). 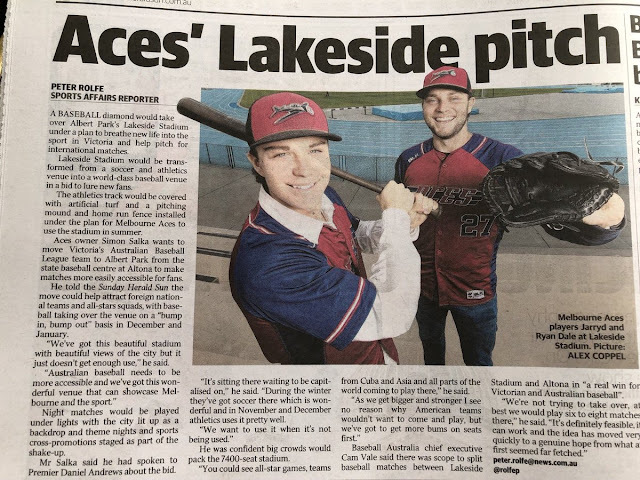 It appears that the Melbourne Aces of the Australian Baseball League are considering shifting the at least some or possibly even the majority of their home matches to Lakeside Stadium. Now for those who need a quick refresher of baseball in Australia. It's been around in Australia for a long, long time; it had a national league that was televised to a degree in the 1990s which eventually tanked; another national comp which tanked even faster than the previous; and it is now on to its third national league, which was initially funded by Major League Baseball but is now in the hands of independent investors since MLB divested itself of most (all?) of its responsibility. Melbourne's current national league representatives, the Aces, play their home games out of the Melbourne Ballpark out in the back blocks of Altona/Laverton, a facility perfectly suited to baseball despite its age (built circa late 19080s), but which is also seen as a white elephant by Melbourne's baseball community, for the simple reason it seems of its location. (Incidentally, while I've seen the quip made by at least one South supporter that this is some sort of proof that FFA selecting a team to be based out of Tarneit is madness, the ideas behind Melbourne Aces and Western Melbourne Group are fundamentally different; more to the point, they also exist within fundamentally different sporting and business environments, with their current suburban proximity - assuming WMG even end up in Tarneit - a mere coincidence rather than anything we can draw causation based conclusions from). Anyway, the Aces struggle to pull a crowd, and their soon to be owner reckons there isn't much point in sticking it out at the costly ballpark which won't pay its own way, because people won't go. This is not a new problem for the Aces, as originally they played out of the Melbourne Showgrounds, a ridiculous situation due to the small size of the field. The solution to the Aces' problem - or at least a big part of the solution - is to play baseball out of Lakeside Stadium. Yes, that Lakeside Stadium, the one that is currently used by athletics and soccer. I can't get my head around how that would even look, and I'll leave that to the boffins behind this scheme to work out - but they reckon it'll be easy to move in and out without undue disruption to the stadium. At the moment, the ABL runs a 40 game regular season with an additional playoff series from November to early February. Typically, each team plays 20 games at home, bundled into series of four matches. These are usually played on a Friday night, Saturday afternoon/evening double header, and Sunday afternoon, with Thursday games sometimes taking a game off the Saturday double-header. Ignoring for a moment the new Aces owner's desire for overseas teams and such to visit - which is a long way from happening considering the crowds the Aces pull now - the Aces are looking to spend part of December and perhaps most (if not all) of January at Lakeside. There do however appear to be contradictory statements when looking at the article in question and some of the commentary on social media around this matter. In the article, the claim is that there would be only 6-8 matches played At Lakeside (equivalent of about 1.5/2 home series), but a commentator on Twitter claims all but the equivalent of two home Aces' series will be played at Lakeside, with probably one at Altona, another at a regional facility. Whatever the specifics of this plan, should it go ahead it will prove disruptive to South Melbourne Hellas (I can't speak for athletics on this matter), because we do spend a fair bit of January training and playing practice games (albeit this year the latter behind closed doors). We already lose access to the ground for a good chunk of the early part of the season (for good and bad reasons), and now this? More running around searching for grounds to train on? If we were able to capitalise on the Aces playing out of the venue by getting people to come into the social club, I'd be less instinctively against the idea, but I just can't see that happening. Fat chance, too, of getting cut from the rent that the Aces would be paying. Of course we'll ll be keeping an eye on developments on this front. I do wonder if the South Melbourne board were aware of this plan. I read somewhere on twitter that we WOULD get rent (or some sort of reward/compensation) of some sort in relation to this? I don't know about that. My first assumption nowadays is that any non-South revenue, even non-South soccer revenue, goes to the Trust first and good luck getting anything out of them.